@johnstepper asked me to not use “WOL” in the name of the canvas since it’s trademarked by him and should not be used by other offerings. I renamed the canvas to “The LOL+ Canvas” (Learning Out Loud) but then another person approached me with the information that he trademarked LOL. 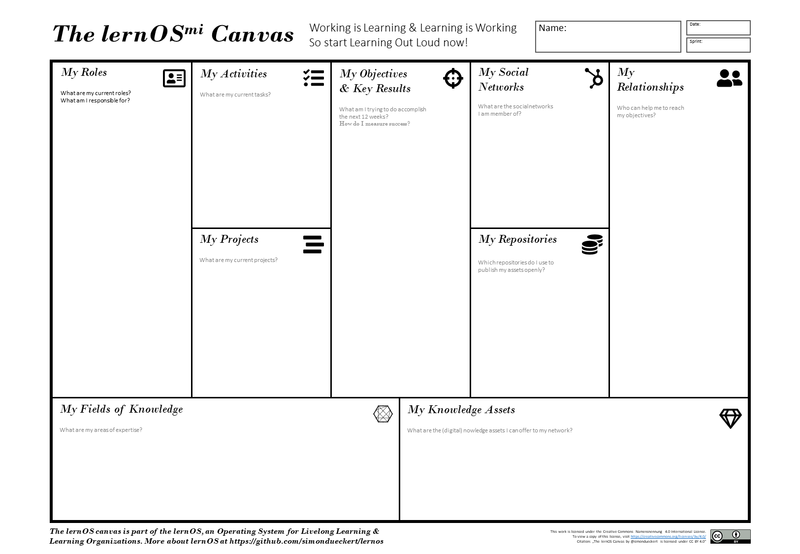 So I made the Canvas part of our lernOS operating system for lifelong learning and learning organization. The lernOS Canvas now lives together with the other lernOS documentation as free cultural work (CC BY) on github. When people had their first Working Out Loud(TM) circle it becomes pretty obvious that practicing an open, connected and digital workstyle brings advantages for them and for their organization. But what do you do after your first circle? How to sustain the practices that were trained in the 12 circle weeks? The lernOS Canvas tries to give an answer to that question and in this blog I explain how. I come from the field of knowledge management (KM) where the learning organization and lifelong learning is “true north”. From the perspective of lifelong learning it’s not a question if 12 weeks for accomplishing a certain objective is too long. After 12 weeks come another 12 and another and so on – until you die (therefore: lifelong). The most important, and indeed the truly unique, contribution of management i the 20th century was the fifty-fold increase in the productivity of the MANUAL WORKER in manufacturing. The most important contribution management needs to make in the 21st century is similarly to increase the productivity of KNOWLEDGE WORK and the KNOWLEDGE WORKER. The most valuable assets of a 20th-century company were its production equipment. The most valuable asset of a 21st-century institution, whether business of nonbusiness, will be its knowledge workers and their productivity. Working Out Loud(TM) is an approach to building relationships that can help you in some way. It’s a practice that combines conventional wisdom about relationships with modern ways to reach and engage people. When you work out loud, you feel good and empowered at the same time. Relationships: Relationships are at the heart of working out loud. The path to opportunities and to knowledge is very often via other people. As you deepen relationships with people in your network, they’re more likely to help you or collaborate in some way, and deepening relationships taps into your intrinsic need for feeling connected to something and someone beside yourself. Generosity: Keith Ferrazzi, author of Never Eat Alone, said, “The currency of real networking is not greed but generosity.” Reid Hoffman, the co-founder of LinkedIn, wrote about the power of “small gifts, freely given.” Your contributions can include things as simple (and powerful) as recognition and appreciation. The reason generosity is a good way to build relationships is because we’re wired for reciprocal altruism. That means that you don’t have to keep score or think of giving to people as a quid pro quo transaction. Rather, you can make contributions in a way that feels good and genuine knowing that, over the entirety of your network, there will naturally be a benefit to you too as others reciprocate. Visible work: You don’t have to be a social media maven to work out loud. You can do it over coffee and email. Using social platforms, though, has a number of advantages. When you make your work visible and frame it as a contribution, social platforms can amplify who you are and what you do; greatly extend your reach; and expand the set of contributions you can make and how you can offer them. The feedback on your visible work can also make you and your work better, thus tapping into your intrinsic need for learning. Purposeful discovery: Given the infinite amount of contributing and connecting you can do, you need to make it purposeful in order to be effective. It needn’t be your One Special Purpose but rather something as simple as “I’d like to learn more about <X>” or “I’d like to explore opportunities in another industry or location.” You can still have room for serendipity, but having a goal in mind orients your activities, including the kinds of relationships you’re trying to develop and contributions you should make. As working out loud becomes a habit, you can apply it towards any goal. A growth mindset: This last element isn’t about things to do but rather a mindset to have as you do them. Carol Dweck, researcher and author of Growth Mindset, showed how you can develop a more open, curious approach to work and life and be more resilient in the face of setbacks. Adopting such a mindset means you’re more likely to try new things and to persist even when someone, for example, doesn’t respond to your contributions as you had hoped. The following chapters describe the individual sections of the canvas and provide some exercises to start working with the canvas. Simple: the simple/obvious domain represents the “known knowns”. This means that there are rules in place (or best practice), the situation is stable, and the relationship between cause and effect is clear. Complicated: the complicated domain consists of the “known unknowns”. The relationship between cause and effect requires analysis or expertise; there are a range of right answers. The framework recommends “sense–analyze–respond”: assess the facts, analyze, and apply the appropriate good operating practice. Complex: The complex domain represents the “unknown unknowns”. Cause and effect can only be deduced in retrospect, and there are no right answers. “Instructive patterns … can emerge,” write Snowden and Boone, “if the leader conducts experiments that are safe to fail.” Cynefin calls this process “probe–sense–respond”. Chaotic: In the chaotic domain, cause and effect are unclear. Events in this domain are “too confusing to wait for a knowledge-based response”, writes Patrick Lambe. “Action—any action—is the first and only way to respond appropriately. In GTD David Allen calls this complex information “stuff” that needs to be organized by the knowledge worker himself. The stuff might feel fuzzy and unstrutured in the first place. The goal is to get stuff out of your head and into a system you trust. David suggets to seperate the stuff in several buckets like lists, projects and reference repositories. There is no boss or superior who can do this for the knowledge worker, it has to be done in self organization. So the first step to get order in your complex topics, activities and projects is to work with the left side of the canvas. Excercise: use the sections “My Topics & Skills”, “My Activities” and “My Projects” of The LOL+ Canvas to collect your knowledge intensive activities that are important to you right now. If you have the “facts about me” list from your WOL(TM) circle you can use them as a starting point. In slower times top management went to nice hotels together with some strategy consultants and came back with a 10 year vision and a clear roadmap. In strategy implementation a 10 year plan was created, roles and tasks were defined and delegated. But these times are long gone. A lot of companies and organizations don’t even create 3 or 5 year plans since they need to plan in a more agile way. Since knowledge management expert Ikujiro Nonaka coined the term “scrum” for an agile workstyle in the paper The New New Product Development Game (1986) scrum and agile methods became a big success story. When working agile you don’t plan for a long period of time but break down a project in short timeboxes (“sprints”), collect tasks to be done together with the product owner (“backlogs”), plan the work for a sprint (“sprint planning”), talk daily about progress and problems (“daily srcum”) and review the results after a sprint (“sprint retrospective”). The method Objective and Key Results first developped at Intel and made famouse by Google brings that agile thinking into the process of obective planning, feedback meetings and performance reviews. A lot of employees today have one feedback session with their boss per year and that is not the most favourite event for both of them. When practicing OKR you set one or more “objectives” for a timespan of 12 weeks. For every objectives you define “key results” as visible and measurable things that you create to reach your objectives. After the 3-4 month OKRs are revied and a new set of OKRs is defined for the next sprint. If implemented organization wide OKRs are definied on several hierachical levels (e.g. Organization, Team, Individual). All OKRs are visible for all organizational members for a maximum of transparency. In terms of WOL(TM) with OKR you make not only your work visible but also your objectives. Excercise: have a look at the results from the last excercise and think about objectives for the next 12 weeks that you can better reach via relationships (existing or new) in your network. For each objective list also the (measurable) key results you expect to create. An old arabic saying says “working alone is addition, working together is multiplication”. So the next question is how to find people that can help you to reach your objectives. You might already have a good idea of valuable relationships from your WOL(TM) circle relationship list. People who did the same thing can help you not to reinvent the wheel or not to make the same mistakes again. As a side effect of networking phenomenons like serendipity and knowledge spillover push ideas and innovations. If you already have a relationship with the people related to your objectives just contact them. If you need new relationships you can use the power of social networks (face-2-face & online social networks). Think about social networks in your organization but also external social networks. A list to start might be: Enterprise Social Network (e.g. Jive, IBM Connections, Yammer), Twitter, LinkedIn, Xing, Facebook, ResearchGate (Scientists), WordPress, Youtube, Slideshare, QQ, Sina Weibo, Toudou Youku etc. Like Stanley Milgram put it with the six degrees of seperation: the people you need are only six steps away or even closer. Excercise: derive necessary relationships from your objectives and intended key results. You can start with the WOL(TM) circle relationship lists and also social networks you started to use. Make yourself comfortable with the principles and features of online social networks and learn how to use them on your mobile device. Excercise: Think about the assets you can contribute to your network. You can start with the contribution list from your WOL(TM) circle. Choose the repositories you need to publish your assets from the ones you have or you are allowed to use. If you want to share your assets internally your IT departement or communication departement might help with possible options. If you want to share externally you should have a look in your organization’s social media guideline and contact your social media manager or other responsible persons for support. When you did your first WOL(TM) circle and you are convinced that working in an open, networked, agile and networked way is good for you and your organization I suggest that you start a mastermind group. A mastermind group is a peer-to-peer mentoring group. The concept was coined in 1925 by author Napoleon Hill in his book The Law of Success in Sixteen Lessons (s.a. Blog 15 Laws of Success from Napoleon Hill, Forbes article 7 Reasons To Join A Mastermind Group). In a mastermind group a small group of people meet on a regular basis to support each other with their individual objectives. In my personal experience with mastermind groups since the 1990s a 5-10 participants are the perfect size for such a group. Excercise: ask the participants of your WOL(TM) circle if they are willing to start a mastermind group after the 12 weeks of having a WOL(TM) circle. A good rhythm might be to have objectives and key results defined for a 12 week sprint and then use one week to reflect on the results and plan the next 12 week sprint. So you get a good structure for one year (12w + 1w + 12w + 1w + 12w + 1w + 12w + 1w = 52w = 1 year). Use a group in a social network or in an instant messenger (e.g. Yammer, MS Teams, Threema, Telegram, Signal) to communicate progress and barriers within the mastermind group on a regular basis (daily of weekly). If only 2-3 are willing think together about other participants that might join the mastermind group. In the next month I will work on The lernOS Canvas and improve it step by step. If you have feedback just put it in the comments below. I will also work on the documentation of the canvas in this blog so the blog content might change a little over time. The lernOS Canvas is released under the most open Creative Commons Attribution 4.0 License. This means that you can download it, use it and also modifiy it in private and commercial contexts. You only have to mention the source like described in the footer of the canvas (same procedure like in Wikipedia). I offer to run a Zoom session in july to give an introduction in the canvas, collect feedback and run a little pilot group. My objective is to have a version 1.0 release end of 2018. If you are interested in participating fill in the doodle poll so we find a date for a 1 hour web session in july. Good idea, put that on my idea list for new blogs. Will see when I have time to write about it. I just saw your note at the very top about not being allowed to use WOL(TM) because it’s trademarked. so, someone promoting sharing, learning, and generosity has asked you not to use the three-letter acronym that has been adopted as a short-form for the work he promotes. Just wanted to make sure I understand that correctly. The circle guides itself are under a CC BY NC ND license (https://creativecommons.org/licenses/by-nc-nd/4.0/). The NC stands for “non commercial”. The CC BC NC ND belongs by the “Open Definition” (https://opendefinition.org, see also https://wiki.creativecommons.org/wiki/NonCommercial_interpretation). thanks for sharing the idea of an offering for people who have attended a WOL circle and want to take this to the next level. Would love to draw your attention to this similar reflexion – not at all related to WOL or LOL but a „selfcoaching/selfreflexion“ set of interrelated questions/items. Looking forward to an open discussion on the different targets of your and Alexanders original YOU canvas, eg. (how) it can be combined or if there are redundancies. Hi Sabine, of course I know the Business Model You Canvas but the scope is quite different. As you can see in the subtitle of the book “a one-page method for reinventing your career” this canvas is about redesigning the “business model of your career”. The lernOS Canvas (aka WOL+ Canvas, aka LOL+ Canvas) focusses on effectivity (OKR), productivity (GTD) and openness (WOL) of knowledge workers.